This unique book offers a Catholic view of the Holy Land in the debate that rages among Jews, Christians, and Muslims. 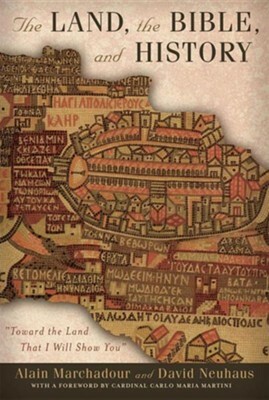 Alain Marchadour and David Neuhaus, two biblical scholars and priests living in Jerusalem, clearly analyze the Promised Land-as concept, history, and contested terrain-in Catholic teaching and doctrine. They offer an analytical reading of the entire Christian Bible (Old and New Testaments) with reference to the idea of the Land promised by God. They explore early and medieval attitudes, especially with regard to the Holy Places and the Jewish people. Moving carefully to the present day, they focus on anti-Semitism, the tragedy ofthe Shoah, Western colonialism in the Middle East, the creation of the State of Israel, and the birth of the Palestinian refugee problem as they examine Catholic reactions to the tumultuous events of the nineteenth and twentieth centuries, particularly the renewal of Catholic thought in the aftermath of the Second Vatican Council. Studying the most recent Church documents, Marchadour and Neuhaus confront the ongoing struggle for peace, justice, and reconciliation in the Middle East. This illuminating book is an essential tool for all those struggling to understand the links between the Bible, the Church, and contemporary Middle Eastern realities, especially in Israel and Palestine. Alain Marchadour, A.A., is former Dean and Professor of Scripture at L'Institute Catholique de Toulouse, and now superior of Saint Peter in Gallicantu in Jerusalem. He is the author of numerous exegetical studies, particularly on the Gospel of John. David Neuhaus, S.J., is Professor of Scripture at the Catholic Seminary of the Holy Land and at Bethlehem University. He is active in Jewish-Catholic dialogue and the struggle forpeace and justice in Israel and Palestine. Carlo Maria Cardinal Martini, S.J., former rector of the Pontifical Gregorian University, spent over twenty years as the Archbishop of Milan. His numerous works include Praying as Jesus Taught Us: Meditations on Our Father and on the Body. I'm the author/artist and I want to review The Land, the Bible, and History: Toward the Land That I Will Show You.